They won the Nu of Nooit contest and were the opening act of Pinkpop festival in 2010 because of that. In the meantime they had signed a record deal and released a self title debut album. Sungrazer from the south of the Netherlands have worked hard since then. They played many shows and also found the time to record a new album. They are three hard working musicians, that play a mix of 70s psychedelica and stoner rock. Thanks to that the band already shared the stage with Fu Manchu, Karma To Burn and Goatsnake. Mirador is also full with nice stoner rock songs and extensive psychedelic jams. It may not be a surprising combination but it's one that works very well. It results in slow heavy grooves, that just keep on rolling while the guitars are going wild. Especially in 'Behind' the engine is in overdrive, which turns into an almost fourteen minute long composition. Because of the repeating riffs and sounds you slowly sink into a trance and you're experiencing the song even more intense. The boys can also play some straight rock too. They prove that in for example 'Octor', an instrumental piece with a big fat groove. They are a band of few words and prefer to let the music do the talking. The other songs are also mostly instrumental with only some occasional vocals. Monotony is lurking since the jams are so stretched out. Of course that's one of the charms of the album but they could move a bit close to the edge once and a while. Naturally this should never be at the expense of those fine repeating elements, that make the songs so catchy. There are many stoner rock bands around that all are fishing in the same pond. They mostly sound alike and are copying the big groups. Only a few manage to separate themselves from the rest. 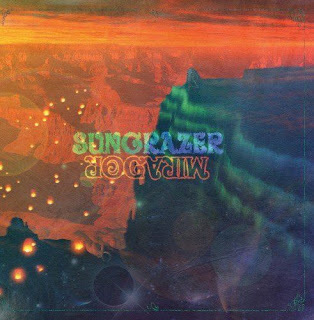 Sungrazer is doing this in a highly effective way, by giving it their own twist. This makes Mirador a very tasteful album. It could be more on the edge but this record is proving the band's qualities.